Researchers have built the world's smallest transistor - one atom thick and 10 atoms wide - out of a material that could one day replace silicon. The transistor, essentially an on/off switch, has been made using graphene, a two-dimensional material first discovered only four years ago. Graphene is a single layer of graphite, which is found in the humble pencil. The transistor is the key building block of microchips and the basis for almost all electronics. Graphene has been hailed as a super material because it has many potential applications. It is a flat molecule, with only the thickness of an atom, and both very stable and robust. The researchers are also looking at its use in display technology - because it is transparent. The global semiconductor business is currently built on sand; stamping out microchips from large silicon wafers. Companies like Intel have a roadmap to reduce the size of circuits on the silicon wafer, down to about 10 nanometres - 10,000 times smaller than the width of a single human hair. Many researchers believe that producing circuits smaller than 10 nanometres in silicon will be too difficult because they start to leak electricity at that size. That current silicon roadmap is expected to end in 2020, making the race to find alternative materials potentially very lucrative. 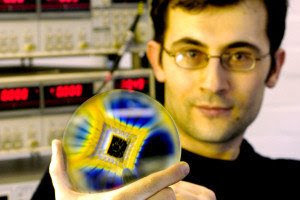 Many researchers around the world are working on creating large wafers of graphene. In order to produce microchips wafers would need to be several inches across. The biggest wafer produced so far is 100 microns across, just a tenth of a millimetre. In the shorter term graphene could be used in LCD displays to replace materials used to create transparent conductive coatings. The material is also being touted for use in solar panels, transparent window coatings and also for sensing technologies.